Over the course of the school’s history there have been many extraordinary graduates, but none more revered than Thomas Nangle (1896 – 1972). In 2016, Thomas Nangle was designated by the Government of Canada as a Person of National Historic Significance for his selfless service to the Royal Newfoundland Regiment and the people of Newfoundland, and his extraordinary efforts to commemorate the sacrifice of all those who served and died in World War I. St. Bon’s erected a plaque in his honour at the entrance to the campus, which was unveiled by Nangle’s daughter in September 2017. On January 17, 2019, our President, Tom McGrath, announced the establishment of the Lt. Col. (Padre) Thomas Nangle, C.F. 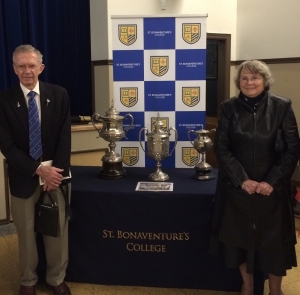 Memorial Bursary by Dr. Neil and Mrs. Mavourneen (Nangle) Galbraith, son-in-law and daughter of Thomas Nangle. 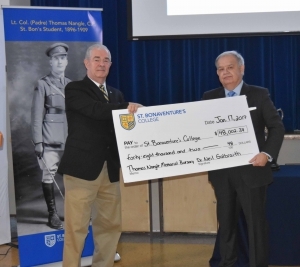 This bursary, launched at a value of $48,002.34, will be a living tribute to Thomas Nangle. This amount represents the funds that Nangle raised for the construction of the National War Memorial in St. John’s in 1922. The Galbraiths currently reside in New South Wales, Australia and were unable to attend today’s announcement, but Dr. Galbraith recorded a message that was played for the guests in attendance. This bursary will be awarded each year to a deserving student who has qualified for financial assistance and who displays attributes of leadership and athleticism and is pursuing a high school graduation. “On behalf of the Board of Governors, I would like to thank the Galbraith’s for this transformative donation to the Endowment Fund,” remarked Nancy Healey, Chair – Board of Governors. Further details regarding the Lt. Col. (Padre) Thomas Nangle, C.F. Memorial Bursary can be viewed here. If you would like to make a donation to the Thomas Nangle Memorial Bursary, you can do so online here. Please choose Bursary Endowment, and note in the In Memoriam that it is for Thomas Nangle.